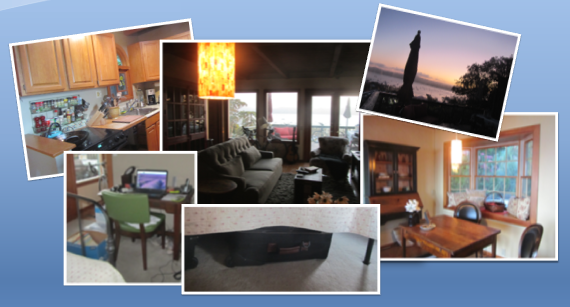 Downsizing | The Worrywart's Guide . . . . When my father died, all of his worldly possessions were in our driveway in Walnut Creek. He left his car in our driveway because he was headed to “Henry’s” funeral – that’s what we called my grandfather because he was a step-grandfather, however, he was married to my grandmother for at least 32 years (my whole life at the time) and the only grandfather I ever knew. Anyway, my dad knew he was going to be spending some time with my grandma, so he packed all of his stuff in his car and parked it in our driveway. That’s when I drove him to the airport and we had our conversation about flying vs. walking. In my father’s blue Hyundai, which had a big crack in the grill because he had hit a hawk or some other large bird while driving down the highway, was a box of golf balls, some power tools, an opened jar of mayonnaise, a paper grocery bag with all of his important papers in it, a journal opened to a page listing how much money he had in each of his accounts lying on top of the papers in the bag (written in pencil in engineering font – it was a really interesting journal – it could have been a book called How to Live for Free – I should find it, it’s at the Tahoe house), and a watermelon that he brought to a BBQ with us at Silver Lake that we never ate (I think my father would agree that I have given that watermelon way too much meaning over the years – it was just a melon, not a symbol of my inconsideration and lack of appreciation). Suffice it to say, moving from a five bedroom house with a fully stocked kitchen, a six burner Wolf stovetop (and the dream hood), a big spa tub, and steam shower to a two room cottage where we have to walk through the bedroom to a tub that fills with water as we shower and keep our clothes in suitcases under the bed (along with a full-size ladder, binoculars, ponchos, bike helmets, shoes, and a tire pump – Hogan’s Heroes comes to mind) is in my blood. We are really happy here. It’s so nice to be just a potholder short of everything one needs.